This guide will walk you through everything you need to know about the TSH including why it isn't always the best marker of thyroid function in the body and which conditions make the interpretation of TSH less accurate. You will also learn more reliable ways to test thyroid status in your body. TSH might be one of the worst ways to evaluate thyroid function and yet it is probably the most widely used thyroid lab test out there. In an attempt to oversimplify thyroid function and management, doctors have become reliant upon TSH testing. And we are going to talk about it in detail below. When is the TSH Helpful? ​This is probably one of the most common questions I get on a daily basis (or some variation of are my lab tests normal). Just take a look at the comment section of any post and you will find plenty of people posting their labs with that exact question. ​So let's answer it once and for all. Is your TSH actually normal? In order to find out if it is normal, we have to first understand what this test is actually testing for. TSH stands for Thyroid Stimulating Hormone and ​it comes from your pituitary gland (1). The pituitary is a ​gland in your brain that attempts to tell your thyroid how much thyroid hormone to produce. So why do Doctors care what the pituitary is telling your thyroid gland? Well TSH turns out to be a quick and dirty way to diagnose both hypothyroidism and hyperthyroidism but it falls short when things get a little more complex. In the case of standard hypothyroidism, your TSH increases. In the case of standard hyperthyroidism, your TSH decreases. But what about the non-standard cases? What about patients who have normal TSH levels but every hypothyroid symptom? Does the TSH work for everyone? When we talk about any hormone we really need to understand how and where the hormone has action in the body. Thyroid hormone is activated inside the cell of the target tissues and it does this through a nuclear receptor (2)(actually thyroid hormone has both genomic and non-genomic actions but the genomic actions are particularly important for symptomatic control). In simple words, it means that thyroid hormone gets inside the cell and directly turns on genetic transcription (it changes your DNA/RNA directly). And this is good, but what is important here is that each tissue has a different demand for thyroid hormone depending on the situation. If you are incredibly sick in the ICU of a hospital, does it make sense for your body to put energy into growing your hair follicles or making your nails strong? Instead, each of your cells in your body has a different demand for thyroid hormone depending on the situation, time of day, stress you are under, etc. So how does this fit in with the pituitary gland? Well, the pituitary gland is just another tissue in the body which has a demand for thyroid hormone and a sensitivity to thyroid hormone. The downside is that unlike other tissues in the body the pituitary is the MOST sensitive tissue to thyroid hormone in your body. It has a different set of deiodinases (3)(these are the enzymes which either activate or inactivate thyroid hormone). Without making it too complex the pituitary gland has only the enzyme which activates thyroid hormone. Now compare that to other tissues in the body which have the ability to both inactivate and activate thyroid hormone (your body does this through increasing or decreasing reverse T3 levels). It's like the pituitary gland has one switch and it's the "on" switch. That means if thyroid hormone is floating around in your body it will eventually make it to the thyroid gland which will cause your TSH to drop. But that does not mean that the other tissues in your body are getting enough thyroid hormone. Now having said all of those things it doesn't mean that the TSH is entirely useless (in fact I will talk about how it can actually help somewhat helpful later). 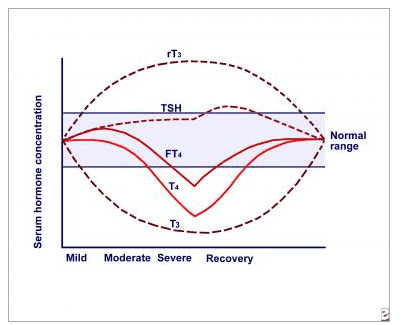 But in order to understand how to evaluate your TSH, you need to understand that there is a huge difference between being "normal" and being "optimal". To start with I have never seen a healthy individual with a TSH > 1.0. This would indicate, at least subjectively, that the ideal TSH (provided disease is not present in any form) is somewhere around 1.0. Nowadays due to the Standard American Diet (4), decreased activity levels, absurd rates of insulin resistance and many other factors, it is truly rare to see a "healthy" person. That means we need to change our definition of "normal". If you look at laboratory tests you will see that a normal TSH level generally falls within 0.5 to 4.5 (or some small variation). ​As you can see the TSH reference range is 0.35 to 5.5. Truly "healthy" people have a TSH < 1.0 and yet the "normal" range extends all the way out beyond 5 in this case. That means your Doctor won't flag your TSH as abnormal unless it falls outside of those reference ranges. ​But as I mentioned above it is important to consider that your pituitary is the MOST sensitive tissue to thyroid hormone in your body. That means it is entirely possible to have a "normal" but less than "optimal" TSH. By these new standards, you can consider a TSH which is greater than 2.0 to be an early indicator of some thyroid dysfunction in the body. It certainly doesn't mean that anything < 1.0 is "normal" (we need your other thyroid and hormone lab tests to determine that), but it does give us some guidance in terms of understanding how someone can be inside the standard reference range and still have symptoms. ​This is where things can get a little more complicated. There are several conditions where the TSH can be decidedly "normal" in fact it can even be sometimes < 1.0 but the patient can still be hypothyroid. Unfortunately, patients who fall into any of these categories tend to get misdiagnosed and/or mismanaged by providers who rely solely on TSH levels for diagnosis. Bottom line: The "Optimal" range for TSH should be < 2.0, anything higher indicates potential hypothyroidism. Do NOT use the standard lab reference range as your definition of "optimal". ​Low T3 syndrome is exactly as it sounds. 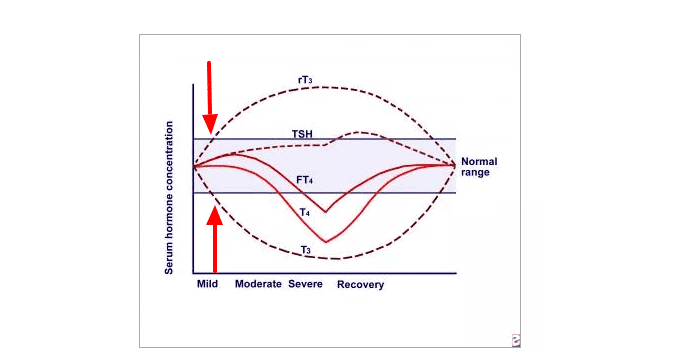 Patients have low T3 but the problem is that they have a relatively preserved TSH (in the normal or even optimal range), but free T3 levels that are either in the low end of the reference range or barely below it. You can see the example below which shows a free T3 level of 2.5 with the reference range from 2.3 to 4.2. 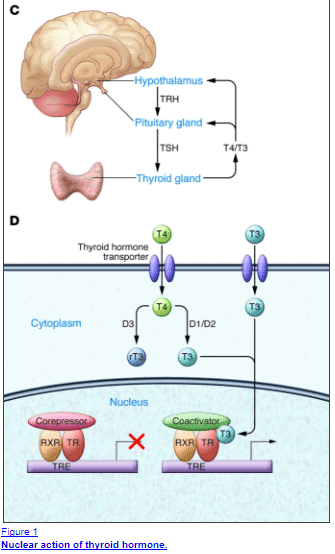 This is a big problem because T3 is the active thyroid hormone. So low levels of this hormone in your blood mean you will have low levels of active thyroid hormone despite whatever your TSH may be. Basically what happens is your body decreases the amount of free T3 and increases the amount of reverse T3 in your body. This is felt to be a protective mechanism to conserve energy when your body is under extreme stress. The problem is that this condition extends beyond the typical acute illness that so many Doctors relate it to. In fact, it has been shown that calorie restriction can even cause low T3 syndrome (5). Have you gone through a calorie-restricted diet in your life? Have you gone through the HCG diet or some other medically assisted weight loss program? Chronic medical conditions like Diabetes, cardiovascular disease, metabolic syndrome, etc. Fortunately, it is relatively easy to check for and just requires the complete thyroid panel which we will be going over below. ​Another subset of patients have what would be considered subclinical hypothyroidism where their TSH is absolutely elevated (even the conventionally trained physician would agree) but their free T4 is relatively preserved. This TSH is elevated at > 3.0 which most physicians would agree is suboptimal (in fact some providers have recommended we change the range to include anything > 2.5 as abnormal (6)). And yet despite the fact that the TSH is > 3.0, in this case, their free T4 is still relatively normal at 1.17 with a reference range of 0.89 to 1.76. Occasionally this scenario will prompt a physician to simply recheck the thyroid lab tests within a month without proper treatment with thyroid hormone. And patients who are in this situation feel frustrated because they are symptomatic with abnormal labs, but still aren't getting treatment. So why does the free T4 stay relatively preserved in some patients? The answer depends but usually is made clear by checking reverse T3 levels. Remember that T4 is simply a reservoir hormone for T3. T4 is inactive unless it is converted to T3. But it can be turned into Reverse T3 instead of free T3 which can put the brakes on the thyroid and your metabolism. But unless you check the reverse T3 level your free T4 may appear falsely "normal" despite the fact that your body is lacking thyroid hormone at the cellular level. This is another big one that I will occasionally run into and it highlights just how good the body is at preserving serum levels of thyroid hormone (or how inaccurate thyroid lab tests really are depending on how you look at it). Below is an example of a hypothyroid patient who underwent a partial thyroidectomy some 20+ years ago. A partial thyroidectomy is a surgical operation in which only half of your thyroid gland is removed and should be compared to a complete thyroidectomy in which the entire thyroid gland is removed. Patients who undergo a partial thyroidectomy may or may not be treated with thyroid medication after their treatment whereas those who undergo a complete thyroidectomy must be treated with medication afterward. This patient was certainly still alive without half of her thyroid gland but she was not thriving. She was experiencing massive weight gain (at one point she was 100 pounds overweight) with constant fatigue, brain fog, and depression. With half of her thyroid gland, she was still able to produce some thyroid hormone but not an optimal amount. 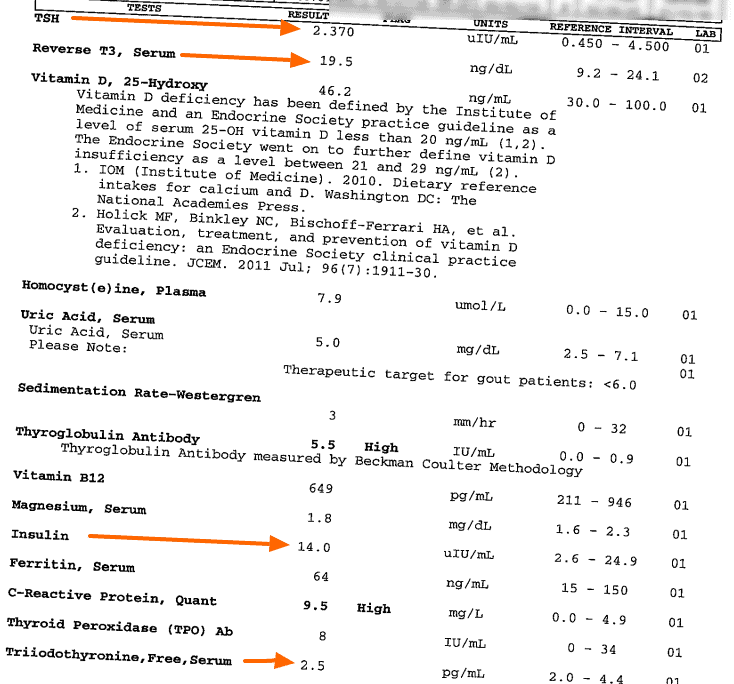 At first glance her labs look "decent" but how can you reconcile these labs with her clinical symptoms? And it wasn't until she was started on Nature-throid (she was previously on levothyroxine but didn't feel any improvement) that she had a near complete resolution in all of her symptoms over about a 6 month period. In the process, her body transformed and she was able to lose more than 50 pounds. In fact, you can see her before/after pictures and her entire case study here. So why is it that this patient was obviously hypothyroid, but she was still able to produce somewhat "normal" thyroid lab tests? Again, it highlights the importance of not focusing solely on the TSH but instead using other markers to help diagnose thyroid-related problems. Taking a closer look, you can clearly see that her other lab tests were indeed abnormal. Her free T3 was in the low end of normal and her reverse T3 was greater than 15. Putting these together, it would be safe to assume she had a conversion issue leading to disordered thyroid hormone processing. When you understand how inflammation (indicated by her high CRP) leads to T4 to reverse T3 conversion (7), her thyroid labs make perfect sense. The situation where patients have hypothyroid symptoms, "normal" lab tests but elevated antibodies to either Thyroglobulin or thyroid peroxidase. Patients in this situation are often told to take the "sit and wait" approach. That is, sit and wait until your body destroys your thyroid gland from inflammation and autoimmunity and then you will need thyroid hormone. ​If the body is able to "preserve" thyroid function after a partial thyroidectomy (as evidenced above) then it is certainly able to preserve function if 10-50% of the thyroid gland is destroyed. This often leads patients with autoimmune thyroiditis until their TSH finally increases to a point where providers feel thyroid hormone is indicated. Obviously, there is a better approach and that is to look and evaluate all thyroid laboratory tests (in addition to the TSH) and treat if there is a combination of symptoms + abnormal lab tests (even if those abnormal lab tests are just antibody levels). ​You can see the TSH at 12.27 with a reference range of 0.40-4.50 in a patient with debilitating fatigue and weight gain for years (undiagnosed) with accompanying elevation in both thyroglobulin and TPO antibodies. This is what will happen to your thyroid gland over time assuming you don't treat the autoimmunity or inflammation, and it just doesn't make sense to wait until the damage is greater than 50% to prove it. Now that you have a basic understanding of thyroid physiology we can discuss another physiologic change which may make understanding your lab tests difficult. There are enzymes in your body, known as deiodinases, which really help to control and regulate thyroid hormone at the cellular level. Thyroid hormone doesn't do anything if it's in your bloodstream. It must make it inside of your cells to turn on your genes and have an impact. And, in order to become active, it needs to be changed by certain enzymes in your body. One particular enzyme, known as D2, plays a major role in converting T4 into the active T3 hormone (8), especially at the cellular level. In this way, D2 helps regulate how much thyroid hormone each cell gets by activating or inactivating thyroid hormone as necessary. While this is a great thing for thyroid control at the cellular level, it can also make diagnosing hypothyroidism more difficult. Because D2 has been shown to increase its activity as thyroid hormone levels decrease in the bloodstream (9). As this enzyme increases in activity, it can do a lot with a little and it can make what little thyroid hormone you have more effective by keeping it active inside the cell. This helps your cells get what they need, but it also may falsely make your lab tests look more normal than they really are. Understanding the way that these enzymes work is essential to understanding why treating to "TSH" doesn't work for all people. In a sense, it doesn't really matter to your body what your serum T4 level is because it cares much more about the concentration and activation of thyroid hormone inside the cell. And this process is controlled by these very important enzymes. Why is it that in all of these conditions (they account for the majority of you guys reading this post by the way) the TSH and other lab tests remain decidedly "average" despite obvious dysfunction in other lab tests? To better understand what is happening in your body it's best to visualize the thyroid lab tests overtime on a chart. Above you can see a chart which depicts all thyroid lab tests over time and based on disease severity. On the left is a mild disease state (inflammation, autoimmunity, chronic infection, dieting, etc.) and as you travel right on the X-axis, you can see how the lab tests change over time. What's important here is that the TSH ​doesn't start to elevate until the disease state has reached "severe". Around this time is when the free T4 level also begins to drop as well below the "normal range". But compare those lab tests to both reverse T3 and free T3 which show changes much earlier than the other lab tests. Both rT3 and T3 can be used as sensitive markers for assessing thyroid disease severity because they become abnormal earlier than other thyroid lab tests. This illustration helps explain (in addition to the differences in deiodinases, tissue level demands, etc.) why not all thyroid lab tests are created equal and why the TSH falls short if used by itself. Even if the TSH is used in tandem with free T4, this combination still is less sensitive when compared to rT3:T3. In addition to the conditions listed above, there are a few other states that make the TSH less reliable. Both of these conditions reduce T4 to T4 conversion (studies showing this link for insulin resistance here (10), studies showing this link for leptin resistance here (11)). In the most basic sense as leptin levels and insulin levels increase, the body preferentially converts T4 to the inactive thyroid metabolite reverse T3. This leads to an "adaptive" state which reduces metabolic energy expenditure. In lay terms, it reduces your metabolism or the number of calories that you burn on a daily basis. Leptin levels and thyroid function are connected. Leptin resistance and hypothyroidism both appear to be caused and sustained by calorie-restricted diets (chronic yo-yo dieting) which cause high reverse T3 and low free T3 levels leading to clinical hypothyroidism. The big problem is that this condition is relatively new and our understanding is limited. But, as a result, it's not well recognized by many providers or physicians who aren't trained to identify or look for it despite the fact that it is highlighted in the medical literature. Bottom line: If you have leptin resistance (as indicated by a high fasting leptin level) there is a VERY high chance you also have tissue level hypothyroidism even if you have "normal" lab tests. This condition may need to be diagnosed by testing both your reverse T3 and free T3 levels together. ​So let's say you are convinced that your thyroid is suboptimal and you'd like to prove it. What tests do you need and how do you interpret the results? Thyroid lab tests shouldn't be used as THE definitive test for diagnosing and managing hypothyroidism by themselves. They can be very helpful for the initial diagnosis and sometimes for management, but once you introduce thyroid hormone into the system exogenously (from the mouth) you have changed the dynamics of the system. I'm not going to go into detail on this now, but just realize the lab tests aren't the end all be all for diagnosis. Having said that they can be quite helpful, especially if you are thyroid hormone naive (meaning you haven't been on medication before). ​As you can see testing for hypothyroidism is far more complex than just testing the TSH (and maybe the free T4). When you understand the physiology and how different aspects like inflammation, insulin resistance, differences in genetics, and leptin resistance alter thyroid physiology it is easy to see how the TSH falls short. Even those "optimal" reference ranges listed above can be misleading in certain cases, but if used in combination with hypothyroid symptoms (and occasionally basal body temperature + resting metabolic rate) it's possible to avoid misdiagnosis. I would also point out that these ranges are really only helpful for those not on thyroid medication already. Once you start thyroid medication several changes take place that alters these numbers and makes interpretation difficult unless you understand the physiology. 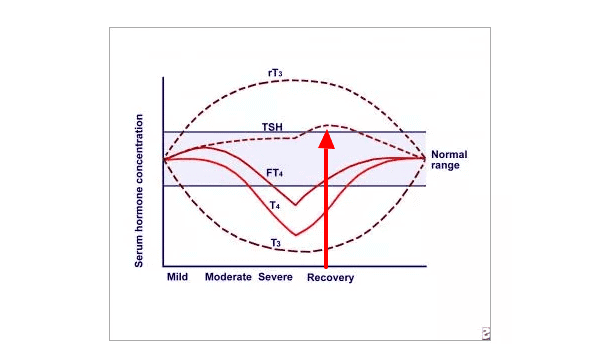 Increasing doses of Synthroid or Levothyroxine will certainly drop the TSH (remember there is no competition for reverse T3 in the pituitary) but may actually make thyroid function in the peripheral tissues worse due to T4 to reverse T3 conversion. ​This pattern is seen very frequently in patients who are treated based off of the TSH alone but have insulin/leptin resistance and/or a history of calorie restricted dieting. If you fall into that category you will need advanced thyroid testing and a provider who can interpret them for you. We just spent all this time discussing why the TSH doesn't provide very much value, but it turns out that it does have some limited value. TSH can actually be very helpful in initially diagnosing hypothyroidism and (sometimes) in helping to determine the ideal dose of thyroid hormone medication. Newer studies have shown that the healthy TSH reference range should be between 0.3 and 2.5 mU/l (13). If your TSH is outside of this range then you should be evaluated further and you should consider a trial of thyroid medication. The rate at which your TSH drops can be helpful in determining your total dose of thyroid hormone needed. Let's say you start with a TSH of 3.5. You start titration with Natural desiccated thyroid and after 2 months your TSH drops to 1.0 on 2 grains (130-135mg) of NDT. This indicates your total dose will likely need to be much higher than someone who drops their TSH down to 0.05 with the same dose. This highlights that each patient has a unique demand for thyroid hormone in their body and standard dosing should not apply to everyone. It's also important to remember that both T3 and T4 will cause your TSH to decrease. 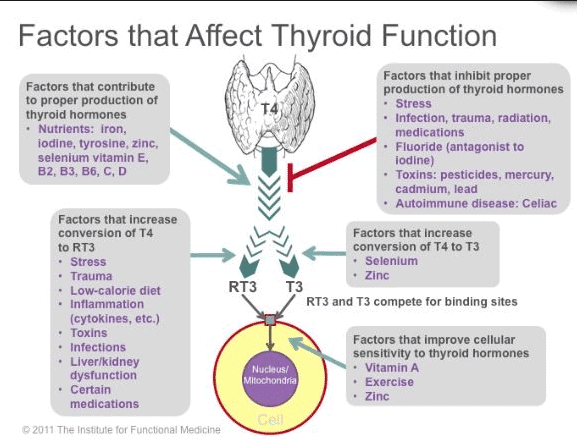 In fact, T3 thyroid hormone is 3x more potent at decreasing your TSH than T4 thyroid hormone (14), so put that into perspective when using medications like cytomel, liothyronine or NDT. ​So if you are started on any medication containing T3 and your TSH does not drop very quickly then that is an indication you might need higher doses of thyroid hormone. ​Once you start treatment with thyroid hormone the TSH generally has less utility than the other thyroid lab tests indicated above, but it still can be useful under certain circumstances. Let's wrap this long post up with a recap and some direction if you feel you fall into any of the categories listed above. TSH can be a helpful test but it really falls short under many circumstances in both the diagnosis and management of hypothyroidism. For several reasons (including pituitary sensitivity to thyroid hormone, hormone changes and differences in thyroid medication) measuring the TSH isn't the most accurate thyroid lab test. In fact, even with the combination of all thyroid lab tests, sometimes a diagnosis can still be difficult to obtain (meaning it must be based on a combination of symptoms and lab tests). In cases of low T3, subclinical hypothyroidism, partial thyroidectomy, and autoimmune thyroiditis the TSH may NOT accurately reflect the thyroid status of your body. If you feel that your TSH doesn't reflect your thyroid status then your best step is to look for a knowledgeable provider to order all of the tests necessary for diagnosis. Generally, this means you will have to look outside of the insurance model (I know it's not what you want to hear but it's just the truth right now) because most Doctors practice what is known as the "standard of care" and that standard is to test only the TSH. If you are working with someone and they don't order the tests or balk when you ask for certain tests that is a good indication they are not the provider for you. I've created a resource designed to help you find knowledgeable doctors which you can use here. Do you feel the TSH has been helpful in diagnosing or managing your thyroid condition? Have you had your other lab tests evaluated? Tests like free T3 and total T3? What is your healthy TSH range?